"I was browsing through various websites, looking for something special for a very dear friend [ her birthday,she lives in Arizona ] when I saw your website. The bracelet that I had purchased from you went perfectly with the shawl that I had sent my friend. 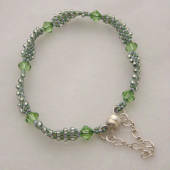 She said that the bracelet was absolutely gorgeous and had received many compliments on it[ she had worn it to church.]" "I love my Botswana agate necklace with Swarovski crystals! I get compliments every time I wear it and people ask where I got it. It's so well made and I know this since I make jewelry also. Your website it very easy to navigate, secure and results in a really fast delivery of beautiful handmade work!" "I bought a great number of your items � and in turn, so did my nanny upon seeing the gifts I�d bought from your site. My husband and I were searching out distinctive, lovely, individual and affordable gifts to give to about 20-someodd people in Russia, who touched our lives during a lengthy adoption procedure. We wanted to give the women who cared for our baby a bit of beauty in return for all they did to make him safe and sound before he came home to us. I was not there when the packages were opened, but I can only hope that they appreciated the fire and the sparkle of these gifts, and that they will be a long-lasting remembrance of their friends in America." I have learned one thing during my beading experience: Quality above all. It ain`t stretchy cord as stretchy cord. There are the ones you wear couple times and they will prolong to "the size of necklace�, or they will break even if you just look at them (just kidding)� I try to buy the best quality recommended products on market. 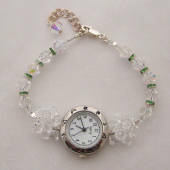 My products like eyeglass chains, necklaces, bracelets and earrings come from reliable US suppliers of beading products. 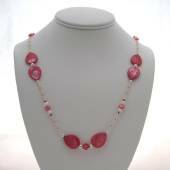 Zuzana Jewelry is a small home based jewelry business located in San Diego, California. We are online since 2003. All our jewelry is designed and made by Zuzana - jewelry designer from Slovak Republic, Europe. 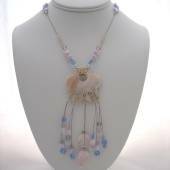 Zuzana makes beautiful handmade beaded jewelry in limited editions. 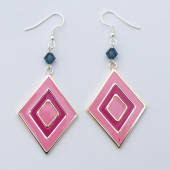 You can only buy one or two of each piece of jewelry you see on zuzana-jewelry.com. Enjoy shopping at ZUZANA-JEWELRY.COM and Tell your friends about us! 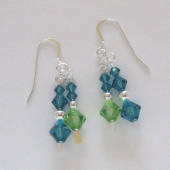 Zuzana-Jewelry.com is a handmade beaded jewelry webstore. 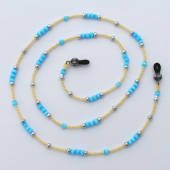 You can browse categories such as Beaded Necklace (long necklace, Medium necklace and Short necklace), Beaded Pendant (Charm pendant, Beaded pendant and Wire wrapped pendant), Beaded Bracelet (Memory wire bracelet, Stretch bracelet, Classic clasp bracelet and Watch bracelet), Beaded Earrings (Pierced earrings) and other Beaded jewelry such as Eyeglass chain, Cell phone jewelry, Bookmarks, Rosary and Jewelry box. All of our handmade beaded jewelry is made by hand. It's designed and made by Zuzana in California, US. We only make a handful of pieces of each jewelry we design and sell online. We are not making jewelry like you can find by the store register in big supermarkets. 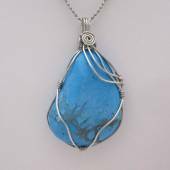 We make handcrafted jewelry that will make you feel good because you know that beautiful jewelry like eyeglass chain or necklace you're wearing is handcrafted in very limited collections, usually a series of 10 pieces. We make unique beaded artisan jewelry, get original handcrafted jewelry like eyeglass chains, standout handmade jewelry designs from independent artisans and craftsmen. Zuzana's beaded jewelry is so much more distinctive than beaded jewelry you're going to see at your local shopping center. 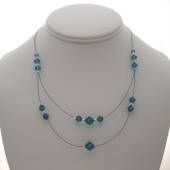 Zuzana Jewelry offers handcrafted artisan beaded jewelry designs, including semi-precious gemstone jewelry, swarovski crystal and pearls, and sterling silver artisan jewelry - it's affordable and easy to quickly buy online. 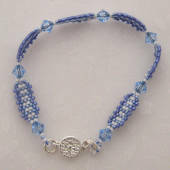 We invite you to in our handmade beaded artisan shop, browse through the beaded designer jewelry. Much of our designer jewelry involves the use of beautiful and powerful semi-precious stones. Zuzana Jewelry designs and handcrafts custom beaded jewelry for any occasion. We have the perfect beaded jewelry piece for you and your loved ones! 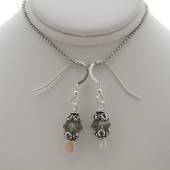 We design a wide variety of handmade beaded jewelry designs like bridal necklaces and bracelets, eye glass chains and holders and you can always contact us about ordering custom made designer jewelry. 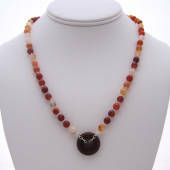 On the Zuzana Jewelry website you will find many unique artisan designs of handcrafted beaded jewelry for example handmade crystal bead eyeglass chain necklaces, and other types of handmade beaded jewelry using only premium materials such as Swarovski crystal, fine Gemstones and Czech glass beads. All that and more can be found in our online jewelry store. 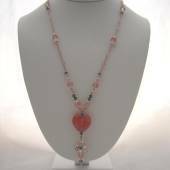 All of our products such as handmade beaded necklaces, crystal handmade beaded bracelets, handcrafted watches and unique artisan pendants are hand made from either the world famous Czech glass beads, or from the world renown Swarovski crystal, or gemstones such as Agate, Amethyst, Fluorite, Jade and others. 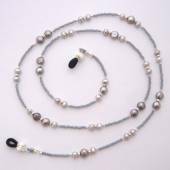 From the United States, we gather the finest sterling silver products such as sterling silver wire and stainless-steel wire and beading cords for each handmade beaded bracelet or handmade bead eyeglass chain necklace creation. Materials we use come from all over the world: Sterling silver beads and sterling silver pendants from Bali and Indonesia, seed beads from Japan, Sterling silver also from United States, crystal for all our beautiful necklaces from Czech republic and Austria.They come in amazing variety of colors that put rainbows to shame and is sure to match any ensemble. 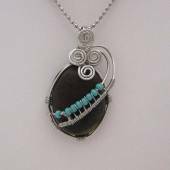 Visit our hand made bead jewelry store to see for yourself. 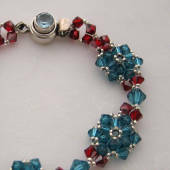 We are certain you will be able to find and buy bead jewelry for your loved ones. We build our handcrafted jewelry using high quality gemstones such as Amethyst, Jade or Sapphire. 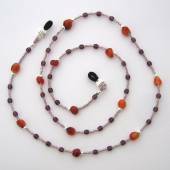 In our bead jewelry store, you can buy unique discount jewelry as sterling silver jewelry, swarovski crystal jewelry or Czech bead crystal jewelry. 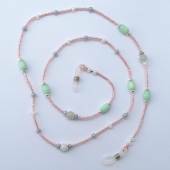 Our jewelry is nicely organized in categories such as handmade beaded bracelet, handmade beaded eyeglass chain necklace or handmade beaded watch to help you with finding hand made jewelry you like. | Phone: 760-583-0850 | All rights reserved.